Subject/s: large, hairy satyrs in a vineyard, from right to left – picking, treading (while holding on to the vine), music-making and decanting (A), Dionysos (tipsy? dancing? ), holding a kantharos and vine tendrils) is accompanied by satyrs who (left to right) make music, provide drink and dance, arms entwined. Above on both sides a miniature frieze of satyrs and maenads dance in the company of Dionysos, seated. 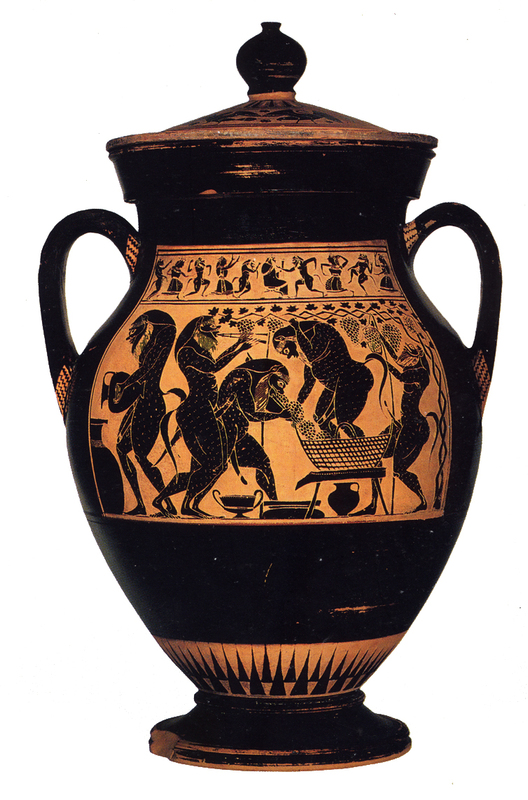 Analysis: unusual shape (amphora of Type A with flat black handles and an elegantly curving two-part foot; compare the Exekian shape that becomes standard) and fine decoration indicate a fine piece, exported to northern Italy in antiquity.